Erin: I'd planned to tell you about the food memoirs I love—travelogues with recipes like Day of Honey: A Memoir of Food, Love & War, by Annia Ciezadlo, an American journalist who marries a Lebanese journalist and travels with him to the Middle East. Or The Sweet Life in Paris: Delicious Adventures in the World's Most Glorious - and Perplexing - City, by David Lebovitz, an American pastry chef living in France. But then my friend Ginny Washington, owner of Jewel Bay’s only bookstore, Food for Thought, insisted you’d much rather hear about the foodie mysteries she loves. I love listening to experts, so I told her she should tell you herself. Take it away, Ginny. Ginny: I never imagined owning a bookstore. I taught high school English. Then I married a school administrator. When he was offered the chance to head the Jewel Bay schools, we jumped. But I needed something to do. The bookstore had been here forever and it smelled like it. Cramped and musty, it still had paperbacks on the shelves that cost 75 cents! Almost before I knew it, we’d expanded into the basement, then the space next door, and now it’s this wonderful rabbit warren perfect for reading and browsing. A Roux of Revenge, by Connie Archer – a soup shop in Vermont, perfect for fall. I’m as much a coffee addict as Erin is, so I loved Billionaire Blend by Cleo Coyle, just out in paperback. I got a sneak peak at the next installment, Once Upon a Grind. To die for. If that’s not too gruesome to say. The Diva Wraps it Up, by Krista Davis. I want to eat at Sophie’s house. But occasionally, I get to eat with the Murphys, and that’s almost as good! I can hardly keep Laura Childs’ Tea Shop Mysteries in – Steeped in Evil is the latest -- and her Cackleberry Club mysteries crack me up! When nothing but chocolate will do, I recommend JoAnna Carl’s Chocaholic Mysteries and Nancy Coco’s Fudge Shop Mysteries. Drooled all over the newest, To Fudge or Not to Fudge, so you probably don’t want me to share it. And of course, I can hardly wait for Stirring the Plot, by Daryl Wood Gerber, out next week. Set in a cookbook shop! And then there’s Ellery Adams, Julie Hyzy, Lucy Burdette, Ovidia Yu ... .
Erin: Ginny, let’s go over to Red’s for a drink. Thanks, all! But before we go, it's my turn to tag the next Sister in Crime in this blog hop, Jordan Bingham from The Wolfe Widow, by that ol’ busybody Victoria Abbott, author of the Book Collector Mysteries. The Wolfe Widow. They’ll be here on Killer Characters this Tuesday, September 30th. If you want to read other hop stops in the Sisters in Crime September SinC-Up, or if you’re a Sister who’d like to join the hop, this link will reveal all. 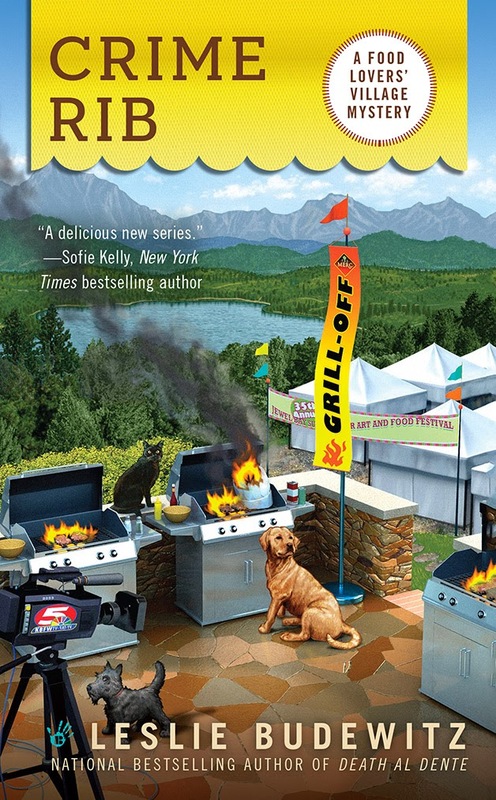 Leslie Budewitz is the national best-selling author of Death al Dente, first in the Food Lovers' Village Mysteries set in northwest Montana, and winner of the 2013 Agatha Award for Best First Novel. Crime Rib, second in the series, was published by Berkley Prime Crime on July 1, 2014. Assault & Pepper, first in her Seattle Spice Shop Mysteries will debut in March 2015. For more tales of life in the wilds of northwest Montana, and bonus recipes, visit her website and subscribe to her newsletter, or find her on Facebook. Great post...and I loved Crime Rib! Thanks, Patricia! Now you and Willow both have longer reading lists! I cannot wait for the Seattle Spice Shop Books!